Set-up. When you are shopping for a shock absorbers upgrade, it is very important to begin by determining your true specific needs. Ask yourself questions like: "Where will I ride? What performance and comfort level am I looking for? What kind of terrain will I ride? What adjustments options “Do I need?" Over-or-under estimate their riding level. Look for more or less adjustment options than they really need. Shop for bargains when they expect high performance and comfort. Shop according to other people's advice that has different riding abilities. Buy something they have tried on a friend’s vehicle that is built different. Don't take the time to review the recommended installation procedures. Look only for something to impress other riders. Buy upon plans they make that may never become reality. Ride on a different type of terrain than what they bought the set up for. Buying used shock absorbers and trying to modify them to fit their quad is not always the best idea. Step 1 : Determine your intended use. Will you use your new shock absorbers for racing or recreational use? Racing shocks will provide maximum performance but will give away a bit on comfort. If after a 1st place finish, you won't need the same set-up as a trail rider on epic 6 hours rides. This second rider will prefer a smoother ride than a 5-second per lap advantage because he wants to have fun more that just raw performance. Most people would think that more adjustability is always better. It's mostly true but only if you know how to use this adjustability properly, and are willing to fine-tune your suspension when you need to. On the other hand, some riders will think that they don't need much adjustment options because they don't always race or ride around the same places. It's true that racers will greatly benefit from more adjustability options because they need to adapt their suspensions to different race tracks and ever changing racing conditions. However, intermediate-level racers may not always need the latest technological gizmo since they won't be able to use the shock to its full potential. 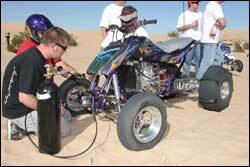 Recreational riders usually ride their ATV in more various conditions than racers. They will have fun on a track one day and head for the sand the next day. The more versatility you except, the more adjustment options you will need from your suspension to fully enjoy your ride. But if you ride mostly the same kind of terrain, you can get away with less adjustability and save some money. Step 3 : Determined how much you are ready to invest. It's sad, but we all have limited resources to spend on our favorite activity. If you are on a tight budget, you will probably want to start with a pair of front shock absorbers. This will already make, a huge improvements over your stock suspension and will greatly enhanced the handling and comfort of your ATV. You can later add a rear shock absorber to match the front when you are ready. If you are serious and want the best you can afford, you may want to go for a full set and add suspension linkage components to further improve the performance of your ATV.